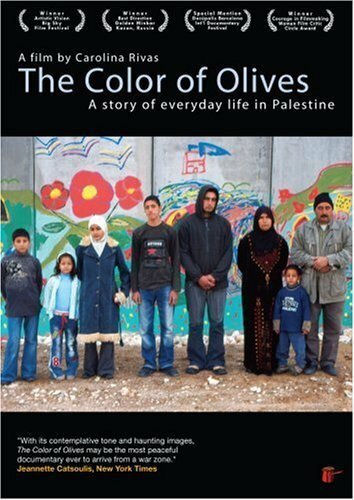 The Color of Olives is a film about defiance and the strength of the human spirit. It tells the story of one family’s resolute stand against an oppressor who has tried – unsuccessfully – to take their home. Hani and Monira Amer have 8 children. Sadly, two of them have died, but the other 6 are alive and well. The family lives in a very special house on the edge of the village of Masha in Palestine’s West Bank. From their front window, they look out onto a wall that stands 20 feet high. It is an evil, grey concrete monstrosity that is higher than the Berlin wall and much, much longer. On their part of it, the family have painted flowers, lush vegetation, rolling green hills and a phoenix, rising from the ashes of the Intifada. The film tells a compelling story at a very human level. It has won many awards, including: Courage in Filmmaking, Best Documentary, Artistic Achievement and several Special Mention awards at international film festivals. When the walls and fences started going up, the family was told they had to move. Their greenhouse and chicken coop, which provided much of their livelihood, were knocked down, and two rooms on the side of their house were demolished to make way for a military road. The family stood fast, and so the walls were built around them. They were locked in, like in a prison, although the guards came and went. Often the guards were gone for hours on end, leaving the family alone inside their home, inside the walls and fences. The two children who died – daughter Fairuz and son Jihan – had been sick, but the parents couldn’t get out through the gates and checkpoints to take the children to the hospital, because the guards were not there. Monira is resolute. She tells everyone she has 8 children. Not 6. Two of them may have died (unnecessarily) but she is the mother of 8 children. Over the course of the week, we see life through the eyes of Hani, Monira and the 6 remaining children: Nidal (20), Hisham (16), Asia (14), Ishak (12), Maisa (6) and Shaddad (4). One of my favourite scenes in the film shows Shaddad digging under the fence so he can crawl beneath it to go out and meet his father coming home from his day’s labour. Maisa sees this and digs a little deeper so that she can get out too. The young children find a resourceful way to get past the fences. They will not be kept away from their father. As with any dark film, there is dark humour. In one scene, Amer is taking his donkey cart out to the fields to work. He has waited 6 hours for the guards to come and open the gate, and when they do, the donkey pulling the cart refuses to budge. Amer has to heave and push and cajole the donkey before it will move an inch. The defiant one is defied by his donkey. In another scene, the family is leaving by car, and to get through the checkpoints they have to show their identity papers. It’s the same guards. It’s a single checkpoint, and the only thing inside the checkpoint is the Amer family home. But to get through the checkpoint they have to show their papers every time – in and out. For all the darkness of the film, and for all the trouble they go through every day, Hani, Monira and their children are a family who face their challenges and get on with their lives. They have made their choice. The land is theirs and they will not be moved from it, no matter what is done to them. The human spirit stands straight and tall. Even when surrounded by high walls and electric fences, it will not be defeated. This is a powerful film that really makes you think. And that is always a good thing. Alchemiya is a Subscription Video-on-Demand service (like Netflix) that acquires, commissions and produces content on a variety of lifestyle subjects, including: art, history, spirituality, education, heritage, travel, fashion, design, business and much more. Avoiding anything controversial – politically or religiously – the team has focused on an upbeat, positive celebration of Islam and Muslim people worldwide. Alchemiya is online and is fast building a customer base of discerning ABC1 Muslims around the world, with paying subscribers from over 35 countries and followers in many more. David Horne is the Co-Founder and CFO of Alchemiya Media. He trained as a Chartered Accountant and has many years experience in the media industry, including 3 years as a Finance Director with the BBC and 8 years as CFO of two companies listed on the London Stock Exchange. A non-Muslim, he fasted with the rest of the Alchemiya team for the entire month of Ramadan last summer and wrote several blog posts about the experience. Read his blogs on LinkedIn. Sign up for a free Alchemiya 7 day trial! Placing profit before the Prophet?